Pluma would like to reach out to readers across the globe and share with them this wonderful undertaking of making ends meet. After a long wait, Pluma’s first collection of poems, No Return Address, is finally out in the global market and ready to inform people from all walks of life of the shared experiences of migrants in their journeys. No Return Address is a fine way to initiate a dialogue wherein people of different cultural orientations may one day find a common ground. Grab a copy of No Return Address: A collection of poems from Lulu and share reading moments with families and friends. 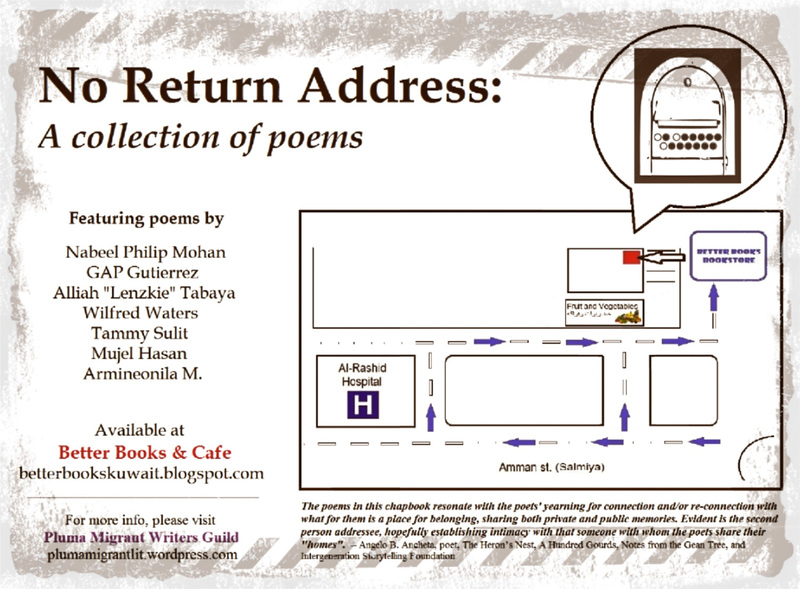 No Return Address: A collection of poems is a chapbook featuring epistolary poems in English written by Pluma Migrant Writers Guild. The book pulls back the curtain on contemporary migration issues in the Gulf, particularly in Kuwait, digging into the hopes and dreams of migrants through traditional and modern correspondence. It features poems by budding writers namely Nabeel Philip Mohan, GAP Gutierrez, Wilfred Waters, Alliah “Lenzkie” Tabaya, Mujel Hasan, Tammy Sulit, and Armineonila M.
The collection contains letters addressed to the ambassador, the haris, the kafeel, a wasta, a stranger, and people who share a slice of the migrant’s life in Kuwait. Readers interested in cross-cultural themes and intercultural communication in the literary scene who have an appreciation for poetry will swoon over No Return Address: A collection of poems. 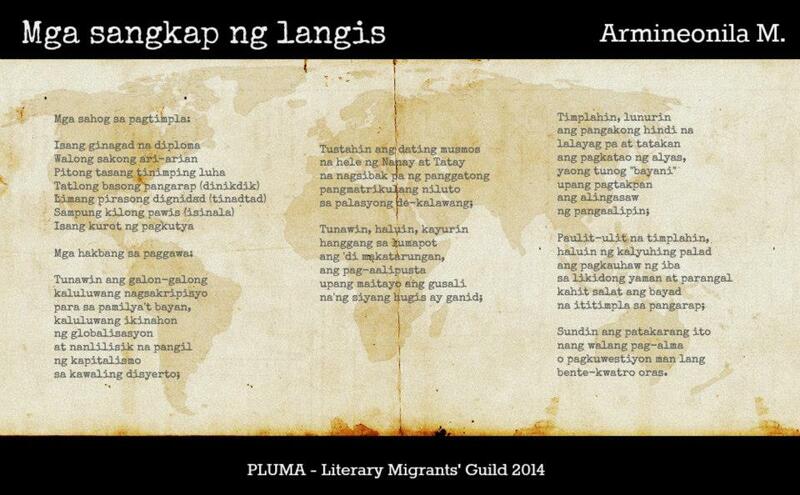 Pluma (Migrant Writers Guild) is a group of literary writers whose works highlight migration narratives. The guild also holds cross-cultural discussions and presentations on various migration topics in the Gulf regions and across the globe. For more info, kindly visit plumamigrantlit.wordpress.com. PLUMA – Literary Migrant Writers’ Guild (Kuwait) is a support group for literary writers in Kuwait that seeks to accommodate poets, short story writers, novelists, and essayists alike who view Literature as a vehicle in shaping societies and weaving cultural values. Established in September 14, 2013, this team of dynamic and creative migrants will soon explore a plethora of individual struggles and personalities from various walks of life. LenzKie is from Buayan, Mlang, North, Cotabato. She studied Bachelor of Technology Education at the University of Southern Mindanao, Kidapawan City. A member and poetry contributor to the school paper magazine in 1996, she was also a University athlete medalist and was a Milo Marathon university participant at the Municipality of Kidapawan, Kidapawan City. She was also awarded Math Wizards Certificates in 1999. LenzKie earned jobs as factory worker, machine operator, production operator, and personal secretary. She is also a business woman and owner of a general merchandise in Cainta Rizal. An OFW in Doha, Qatar and currently Kuwait, this young poet also helped distressed OFWs in the country. LenzKie is also an administrator of the Otusa TV Internet – Facebook Television of Manny Calpito, and the Manggagawang Migrante ng Kuwait (MMK). She submitted tribute poems to the Pilipino Bloggers Magazine and to Doc Penpen Takipsilim’s Pentasi B.
Armie is a native of Barotac Nuevo, Iloilo, Philippines and an OFW. She studied Comparative Literature in the University of the Philippines in the Visayas, and was a member of the UP Miag-ao Experimental Theatre (UPMET). She has submitted paintings to Museo Iloilo in 2005. A member of the Filipino Cultural Club (FCC) Kuwait since 2004, she is currently the Executive Secretary of the Filipino Association for Culture and the Arts in Kuwait (FCAK), 2012. She was elected as President of the OFW Gitarizta Family online group of songwriters and musicians worldwide in 2010. Armie is a feature story writer and opinion writer in English on Kuwait Times Daily and Friday Times since 2005. She also writes her weekly column titled “Kikay’s Ukay-ukay” since 2008, and submitted the weekly comic strips titled “Pat en Tero” in 2009 for the Filipino Panorama, Kuwait Times. She has contributed poems to Kuwait Philippines Cultural Centre (KPCC) Pag-usapan Po Natin monthly magazine in 2011 and short stories to The Filipino Magazine in Kuwait (TFM), in 2011. Her poems appeared in Best Poems Encyclopedia in 2010. Armie is also an advocate of the Philippine’s prehistoric system of writing, the Baybayin. An animal rights advocate, vegan, and volunteer at the Protecting Animal Welfare Society – Kuwait (PAWS-Kuwait) since 2011, she has established various advocacy groups such as Animal Rights Advocacy Philippines – ARAP, Vegan Kuwait (support group for vegans in Kuwait), Gitarizta ng Bayan (supporters of the Original Pilipino Music), and Digital Literature and New Media (study group on contemporary Literature). GAP is currently employed as a nurse in Kuwait. He claims he has never been a member of any writing group before Pluma. He once won 2nd place in an essay writing competition on his 4th grade, which he believes as his highest achievement in writing so far. GAP has a small collection of books and graphic novels and believes that “art will not really save mankind, but it will make our stay in this world worth its while”. Furthermore, he doesn’t like to talk about himself in third person. A registered nurse, Tammy graduated in Ateneo de Davao University in 2008. She started writing poems during her high school years where she was also the photojournalist of the school publication. In college, she became a member of the Literary Writers Guild. Tammy is always fascinated with life’s beauty and mysteries, thus, making these as sources of her creative outputs. Aside from writing, she also loves theater arts, visual arts, and dancing (which is so far her most honed talent). She has always been an active advocate of nurturing creativity. For her, an artist will always be an artist whatever medium one uses to create the craft. The creativity will subtly blend on the masterpieces molded. Presently, Tammy is honing both her photography skills and writing skills here in Kuwait, being it as her new home, hoping that someday she will be able to share the quirkiness inside her head to the readers of PLUMA. Born on the 13th of June and is currently working as a nurse, Mujel loves to read in his free time. He claims to have had no firm background in Literature, however, he once served as editorial assistant in the college school organ. For Mujel, any form of writing is an awakening. It’s a tool where everyone can discover and learn many valuable things. He believes that “the ultimate purpose of Literature is to empower the human mind to act rightly and judiciously with compassion, to pursue God’s path towards society’s lasting existence and redemption”. Wil is from Australia. He has been making maps for an environmental project in Kuwait since April 2013. When he was a kid growing up, everyone always told him he had talent as a writer. Of course this meant he spend the first 10 years of adulthood doing something completely unrelated, just to prove everyone wrong. Now, after a decade of bitter unhappiness and sorrow, the pen is again in hand and putting flame to paper.